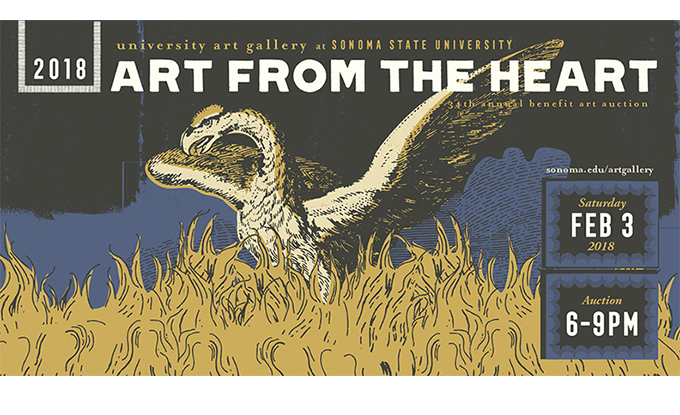 Sonoma State University's Art from the Heart party and silent auction is an exciting evening of art, food, fine wine, and music that has become one of the longest continually-held fundraising events in the area and a "must" for novice and seasoned collectors alike. The 34th annual reception and silent auction is Feb. 3, 6-9 p.m. in the University Art Gallery at Sonoma State University. More than 120 artists from Sonoma County and across the United States have been invited to create original works of art especially for Art from the Heart, which features modestly priced works of art sold during a silent auction. This year the artists include Sally Baker, Todd Barricklow, John Casey, Nuala Creed, Cynthia Hipkiss, Robert Hudson, Karen Kelly, Kurt Kemp, Tony King, Hung Liu, Mark Perlman, Catherine Richardson, Frank Ryan, Sylvia Seventy, Jennifer Sturgill, Jack Stuppin, and Wil Smith, among many others. Dave Getz Jazz Trio will provide music. Tickets to attend are not necessary this year; instead, the University Art Gallery is proud to partner with Creative Sonoma, a nonprofit organization in Santa Rosa helping to direct emergency services and relief aid to the region’s vast community of artists. Creative Sonoma will be present at Art from the Heart to accept donations and provide information about the various relief funds for artists affected by the fires. By waiving the admission fee at this year’s event, we hope our guests will consider a donation of any kind to Creative Sonoma. A free preview of the artwork will be shown Jan. 31 and Feb. 1-2, at 11 a.m.-7 p.m. in the University Art Gallery. Food and wine will be served. Parking is $5-$8 on campus. For more information, call the University Art Gallery at (707) 664-2295. (Sonoma County) New York Times columnist, author and political commentator Charles M. Blow is never one to shy away from controversy - from politics and the presidency to immigration reform and the Black Lives Matter Movement.